Chris wanted to see John Carter today and although I reservations about it, I agreed to go see it. The movie had the tell-tale of a cheesy fantasy or sci-fi movie, at least based on the trailers. It was better than I'd expected, but I wouldn't say it was great. With a token "strong" female character (which ultimately still needs to be rescued. Why? Because it is apparently difficult to write any other type of female character) I was instantly off-put. Combine that with cookie-cutter character archetypes and plot and I'd say the movie was manufactured to be what it is. I honestly have a really hard time with most movies. They're typically too short for the type of character development I crave and rarely feature complex/morally ambiguous characters. I've been told I'm too critical and don't like any movies (I like Monty Python movies! Don't those count?). So maybe you shouldn't take my word on this movie. I've started to read the book, A Princess of Mars, which the movie is based on (I usually try to read them before seeing a movie). I'm already more interested in the book. Anyway, onto the chairs. Because really, that's what the photos about. While we were out on Alpine to see the movie, we swung by the store to see some chairs Chris has been eying for awhile. They were on sale so Chris wanted to pick them up while there was a good deal. Well, we just have one car between us and I wouldn't say the Fusion is very good in terms of space. 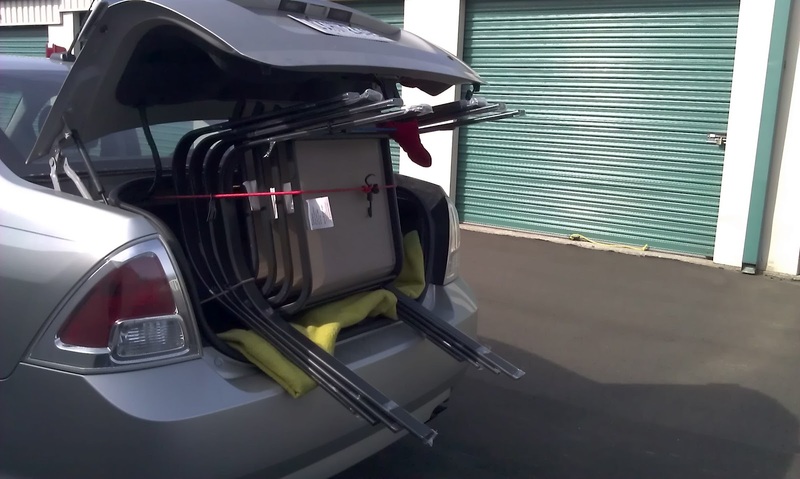 So that meant if we wanted the chairs, we were going to have to jam them in the trunk and strap everything down. Thanks, mom and dad, for those bungie cords when I first got my license. I can't tell you how many times, over the years, I've used those things.